Wednesday night is Bible study time at my church. We don’t have worship music, we just seriously open God’s Word and dig in. Mrs. Laurel is an awesome teacher. She makes the Scripture come to life. I have learned a lot under her. 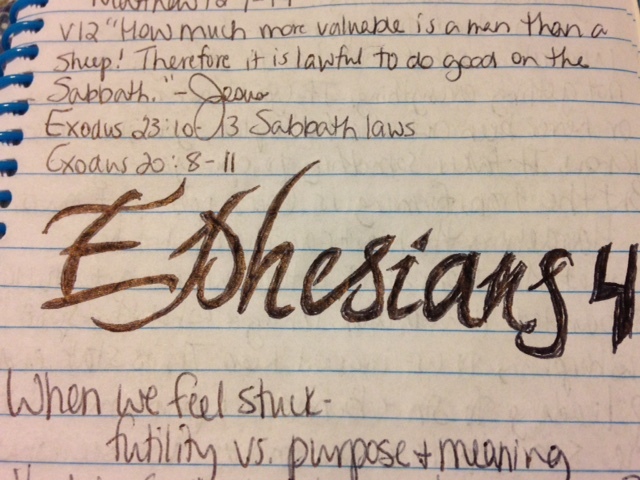 This week, we were in Ephesians 4. I was playing around before church and copying the font in my Bible that I love so much. Dictionary.com defines Futile as “incapable of producing any result; ineffective, useless; not successful”. Ouch. Futile is a harsh word. There has probably been a time in our lives though, if we are honest, that we’ve all felt this way. In Jon Acuff’s groups on Facebook, I know many people in there have felt this. In Ephesians 4: 17-20, it sounds like our lives before becoming Christians. Paul is speaking to Christians, though. They are living futile lives, stuck, and not moving forward for God. You can be a believer and be stuck. It’s a normal thing. BUT we shouldn’t stay there. If we allow something to darken our understanding, to confuse us, or if we are ignorant about things, it causes separation for what God has for us. We can even harden our hearts towards God and things of God.. this can cause us to get stuck. In order to break free from futile living, we’ve got to make a decision that we want to be transformed. God does the transformation through Scripture, prayer, church, and meditation. Living by God’s leading let’s us prosper and not be stuck. We transform into who He planned for us to be all along and His Word is what changes us. Are you stuck? Do you feel like you aren’t growing or nothing is going right? Get back to the basics. Pray everyday, read the Bible, and memorize Scripture. Even last night at Zumba small group, the leader Sharon said that if we put in Scripture, it comes out when we need it. That’s so true. Like Mrs Laurel said, It’s not about RULES! It’s about your relationship with God and growing closer to Him. If you feel stuck and would like me to pray for you, please contact me. I’d be honored to pray.